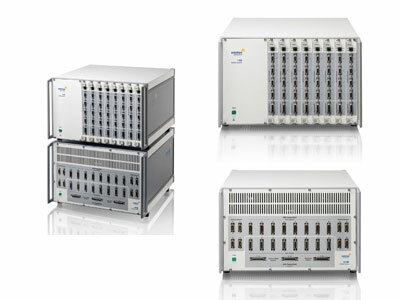 The Solartron Analytical CellTest System is a multi-channel potentiostat for complete DC and impedance characterisation of a wide range of energy storage devices. It can also be used to analyse sensors, coatings and corrosion, as well as general electrochemistry. These are connected to a PC for simultaneous DC and impedance tests on multiple cells. Each 1470E unit incorporates eight fully independent floating potentiostats. This means that up to eight separate cells can be tested simultaneously. Each channel is completely independent, so they can run the same or different experiments. The CellTest system is capable of a wide range of techniques, including charge / discharge, potentiostatic, potentiodynamic, galvanostatic, galvanodynamic, fast cyclic voltammetry, open circuit, fast pulse and step techniques, ohmic-drop analysis and impedance. Simultaneous Electrochemical Impedance Spectroscopy (EIS) tests can be run on multiple cells by connecting 1455A/1451A series FRAs to the 1470E. These FRAs can run in single sine correlation or multi-sine / Fast Fourier Transform (FFT) mode, for speed, precision and accuracy. Temperature controlled ovens and furnaces can be added and controlled by the PC, to test cells at varying temperatures eg measuring solid oxide fuel cells at up to 1000 °C. Both the 1470E and 1455A/1451A FRA modules are Ethernet controlled. They can be controlled locally or remotely, from a PC anywhere on the network. You can set up and run your experiments from a quiet office environment, with the test equipment and cells in another room or building. For a lower cost option, the 1470E potentiostat be used with the Solartron 1260A Impedance Analyser or any Solartron FRA to provide impedance measurements using 1470E’s built-in multiplexer. EIS accuracy is the same. This set-up is suitable for when occasional EIS measurements are required while channels are DC cycling. This configuration can only operate in GPIB control mode (not Ethernet).